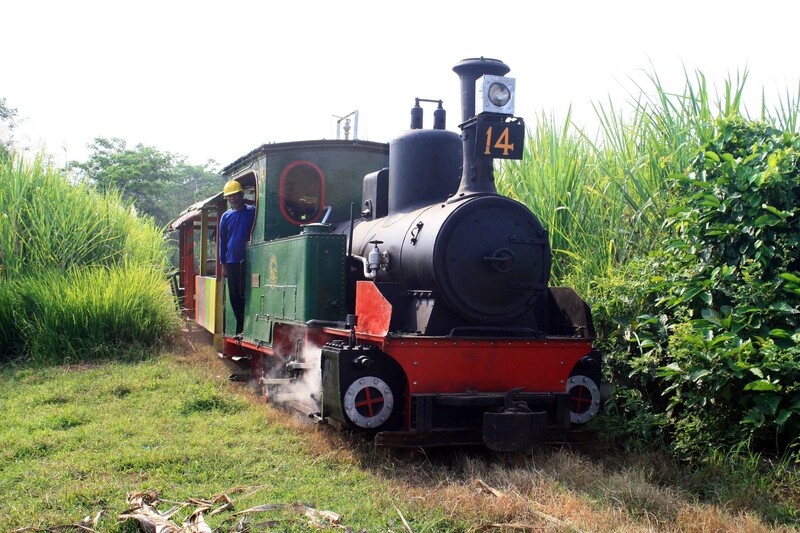 Ever since I become fascinated with narrow gauge sugarcane trains in 2012, I always want to see more of this unique piece of railway. 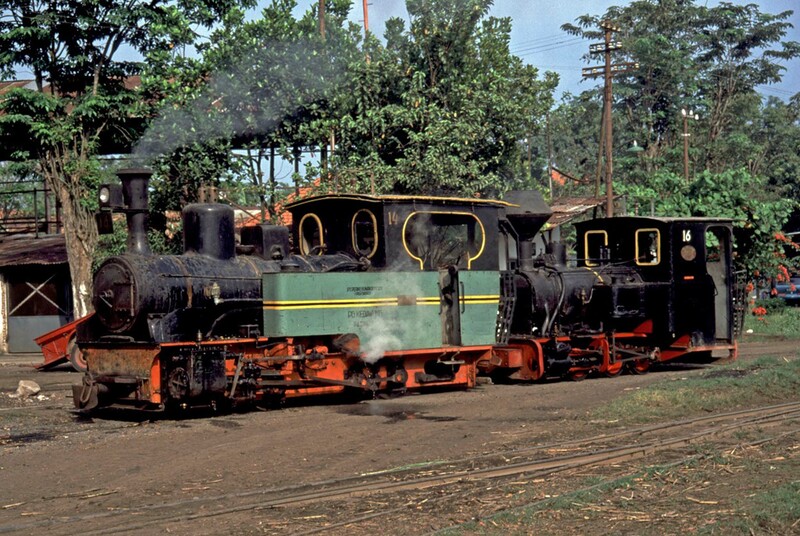 And the eastern part of Java Island has plenty of them still in operation in recent times. 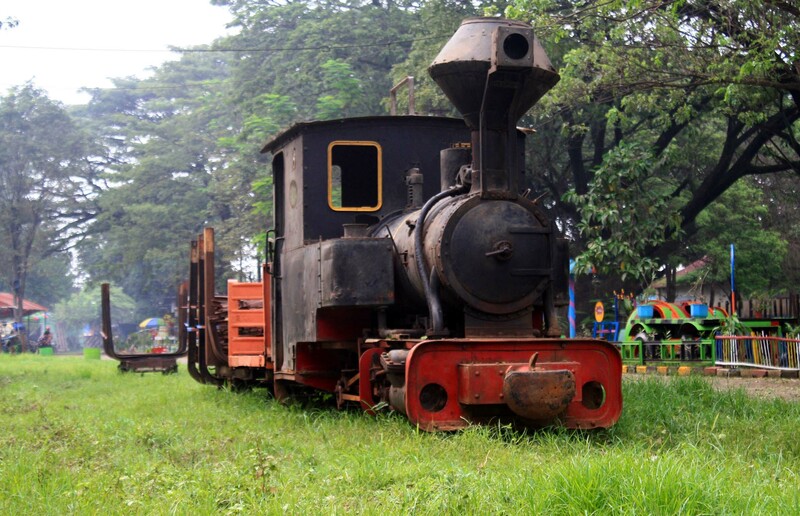 Coincidentally, in that year I began to move from Bandung to Surabaya, and I used this occasion to get closer and deeper with the narrow sugarcane railway, and also tries to reconnect with the rare railway that was part of my childhood but now largely gone on elsewhere outside in East Java. 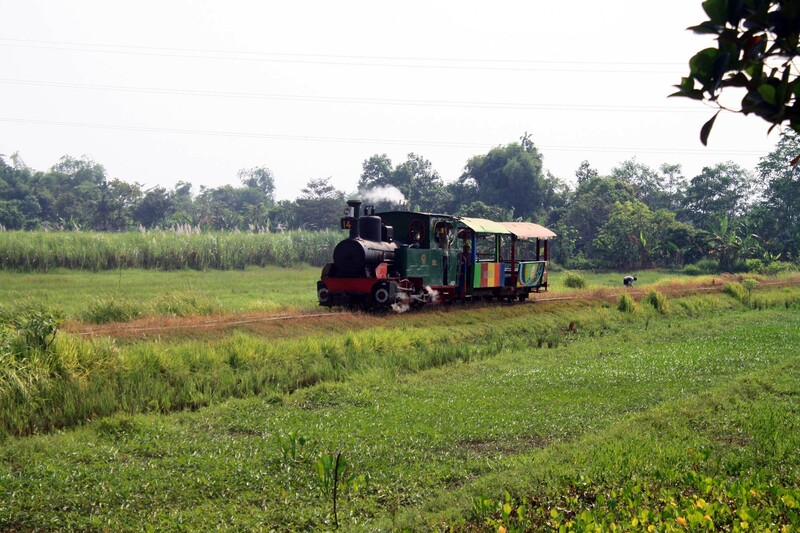 Back when I was kid in 1980s and 1990s, there were plenty of narrow gauge sugarcane railway network located within less than an hour of driving from Surabaya. 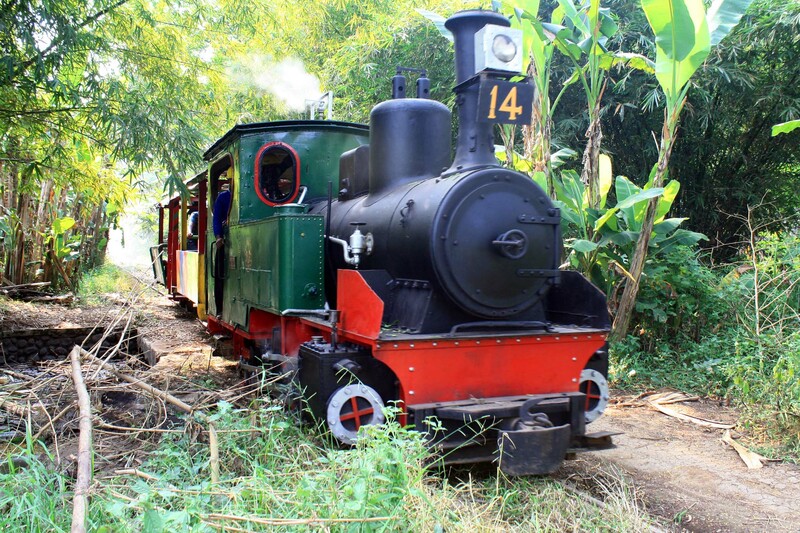 But since back then I wasn’t enthusiastic of the narrow gauge railway, I overlooked the progress of what happened throughout the years. 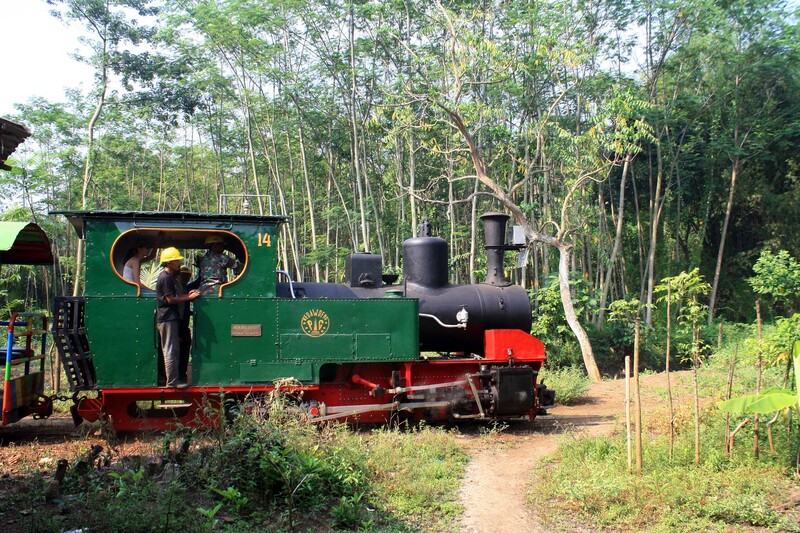 By the time I became committed narrow gauge railway enthusiast in 2012, I realize very little are left these days. But not all are lost. 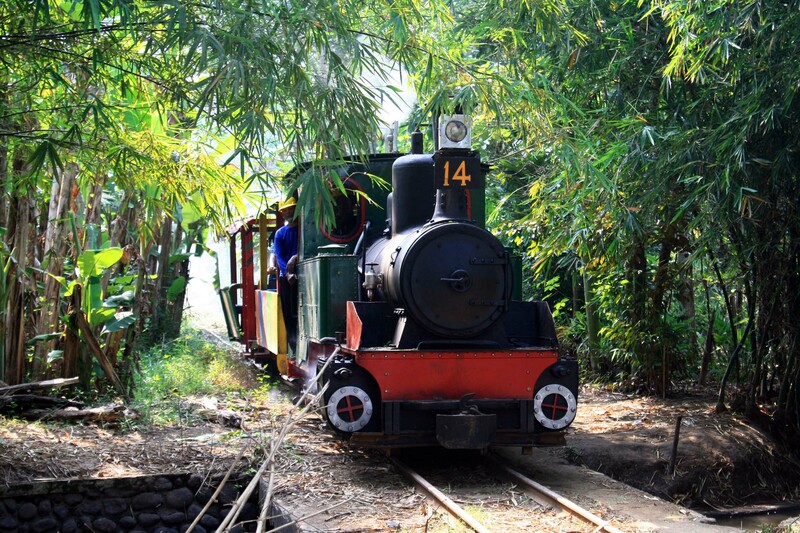 Fortunately, there is one place where I can enjoy narrow gauge sugarcane railway scene, without the need of lengthy drive and overnight stay away from Surabaya. That place is called Kedawung sugar mill. 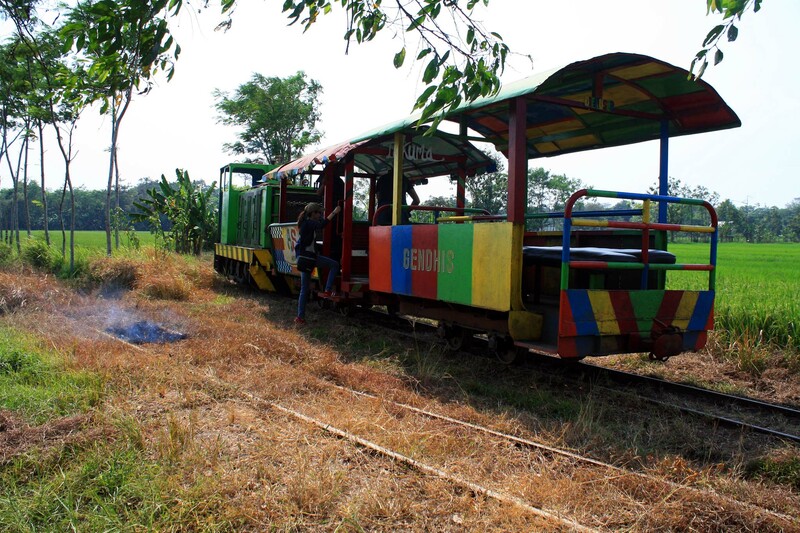 Located to the east of Pasuruan, this quickly become my favorite “trainspotting” place, especially as harvesting season comes. I first visited the place in 2013. 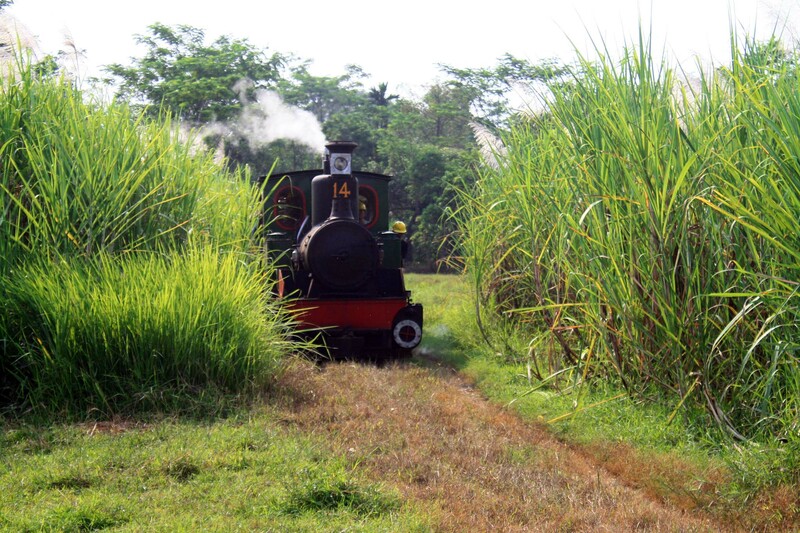 Back then, I was overjoyed to find the sugar mill operates its field lines network. 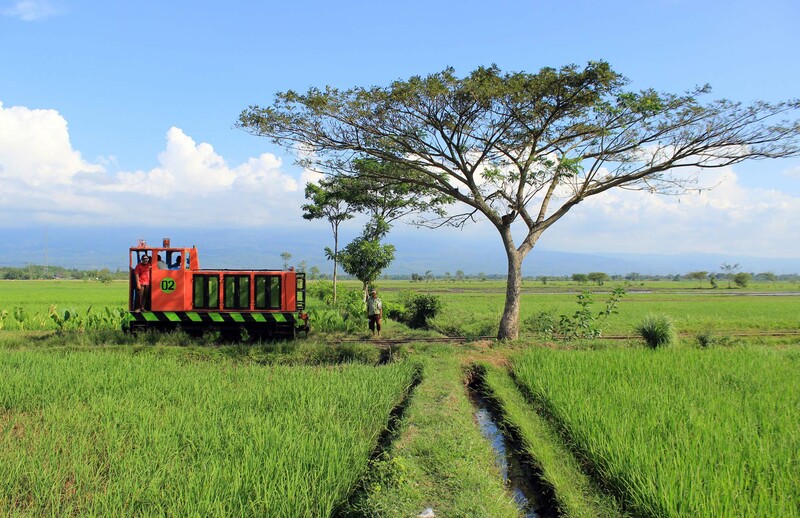 It’s truly marvelous considering on how rare the presence of field workings are these days, added to the fact that it also has beautiful surrounding scenery, including the fact that the mill’s estate is located at the foot of famed mount Bromo-Tengger National Park. However, there is one thing that is lacking in here: the presence of steam locomotives. 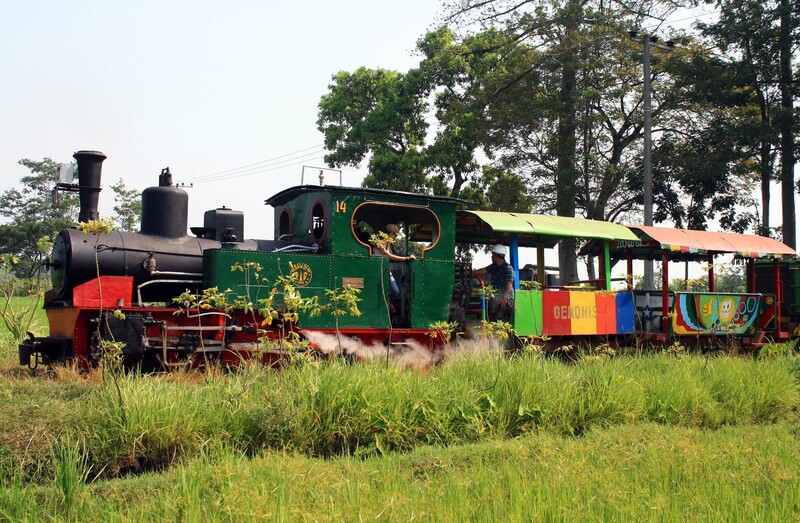 Indeed, just like many sugar mills in Java, Kedawung ended their regular steam locomotives operation in mid 1990s, while some worked for chartered trains up until 2001 or 2002. 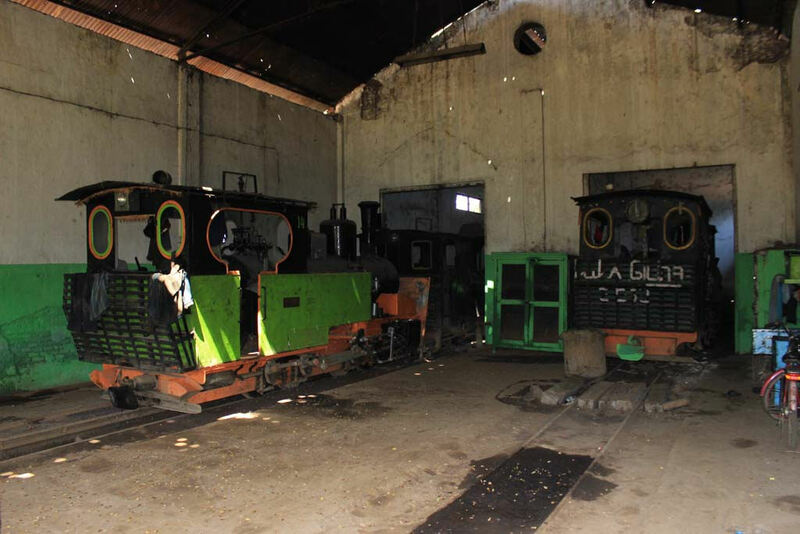 Beyond that, their steam locomotives were stored in rather derelict condition in the shed. Like what is seen in this 2013 photo. These days, the railway works are done by diesel locomotives, whether if it’s shunting inside the mill or field workings. 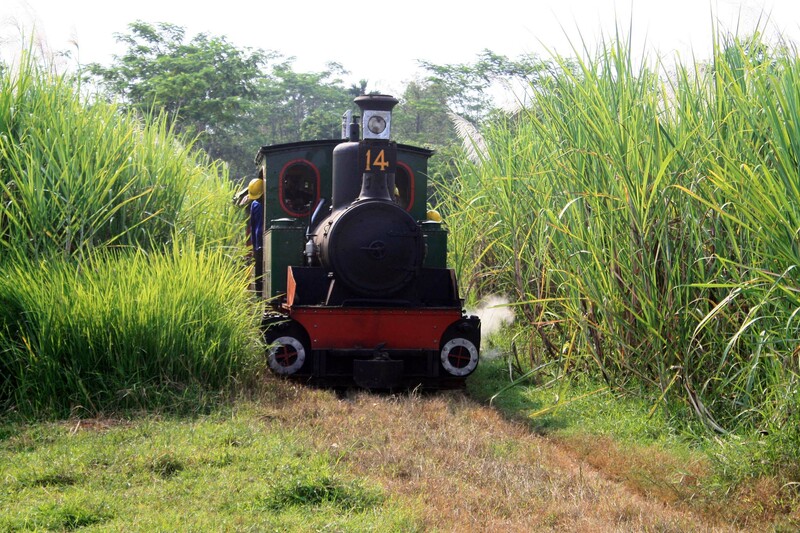 This made Kedawung sugar mill rather “dry”, in essence that it is lacking of steam locomotives working. 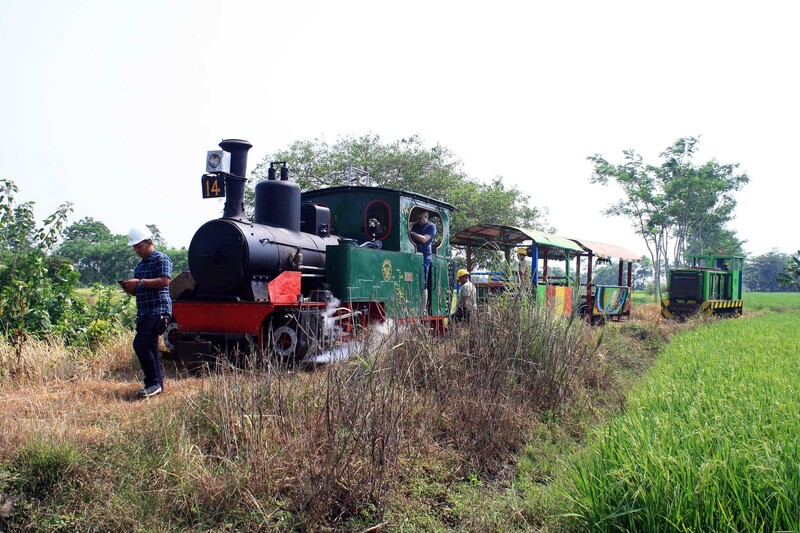 A presence of steam locomotives at work would surely make the scenery much more lively, like what I see in Olean and Semboro (where both operated their steam locomotives for chartered field workings), or in Tasikmadu. 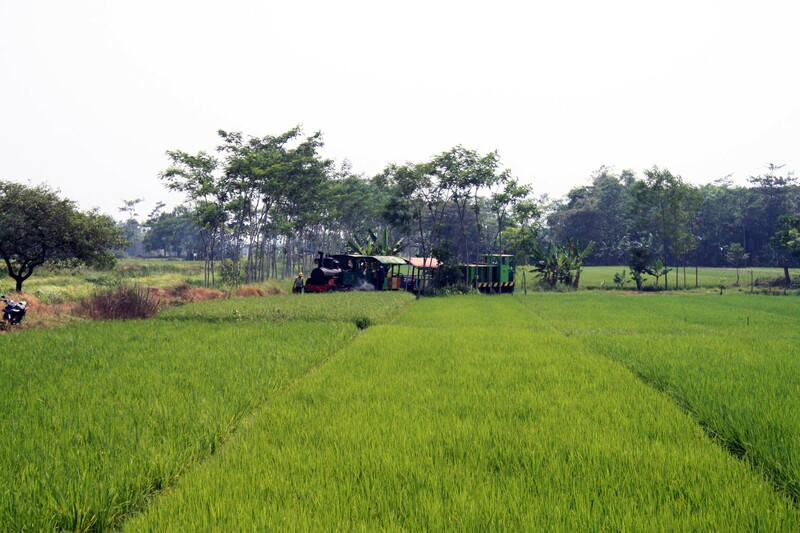 Unfortunately, these mills are located well away from Surabaya, and it require lengthy driving plus lodging at the nearby town/city. But things began to change, in a rather unexpected way. 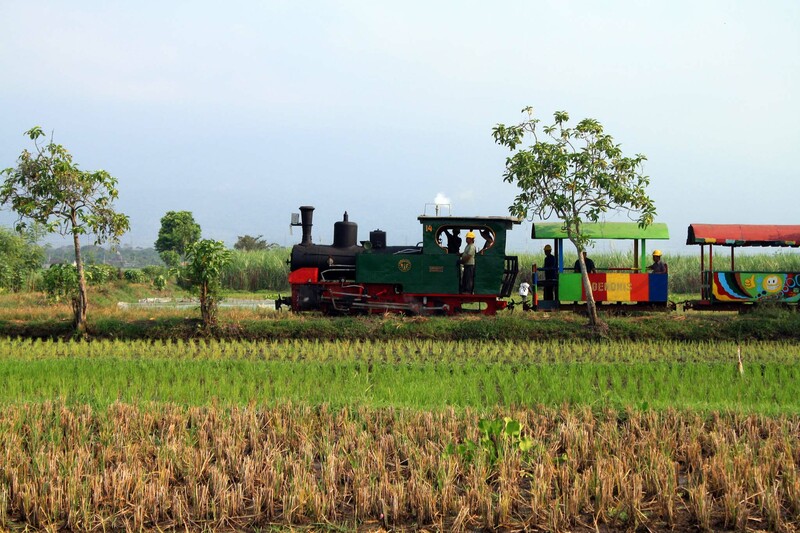 In late 2017, Kedawung sugar mill management began to set up a theme park on their premises (akin to Agrowisata Sondokoro in Tasikmadu sugar mill), named “Agro Wisata Selfie”. The project, which was initially started as “just for fun”, turned out to generate significant revenue for the mill. It is said that it even overshadowed the revenue generated from sugar production. 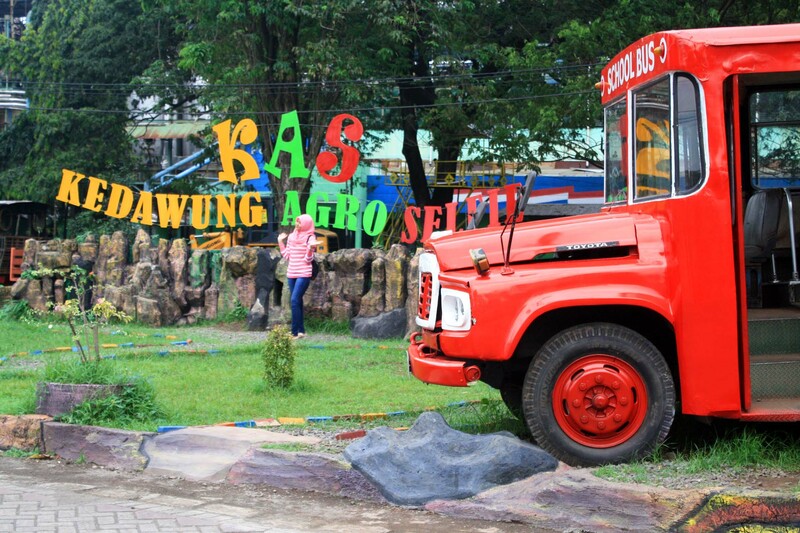 This theme park is actually made of several old artifacts that are repainted and polished to make it looks attractive for “selfie”. 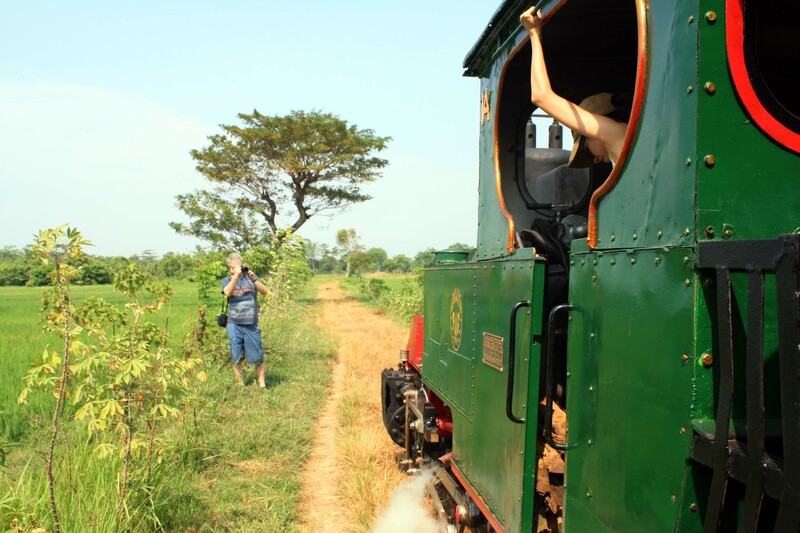 It also includes excursion train that runs to westerly direction from the mill complex, where passengers can get to see beautiful scenery along the way. And among the items that are renovated (cosmetically) for the theme park are the steam locomotives. Once derelict inside the muddy shed, now they’re taken out, repainted, and put on display. Like this Maffei-built number 17. 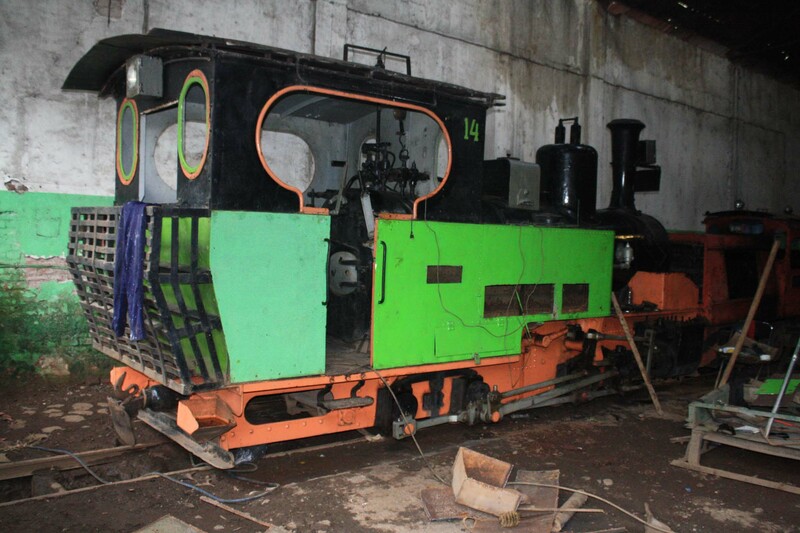 This 1909-built locomotive was once parked in very derelict condition in front of the locomotive shed. 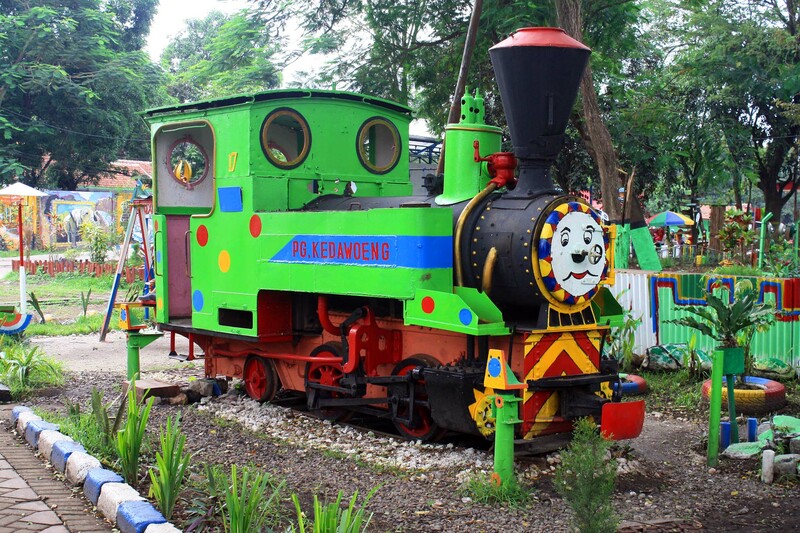 But when the theme park project commence, they repaint the locomotive in this lively color. Although the new livery looks clownish and ridiculous, at least it is still better than having it scrapped. 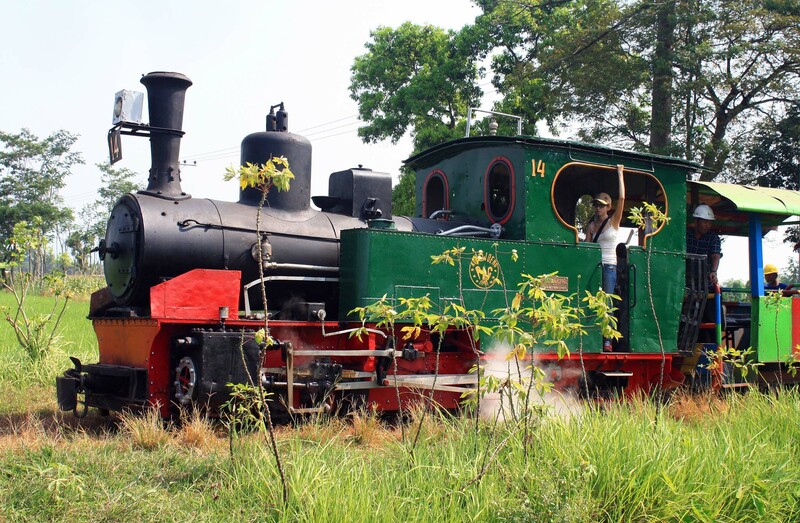 Another locomotive that is taken out for display is this steam locomotive number 16. 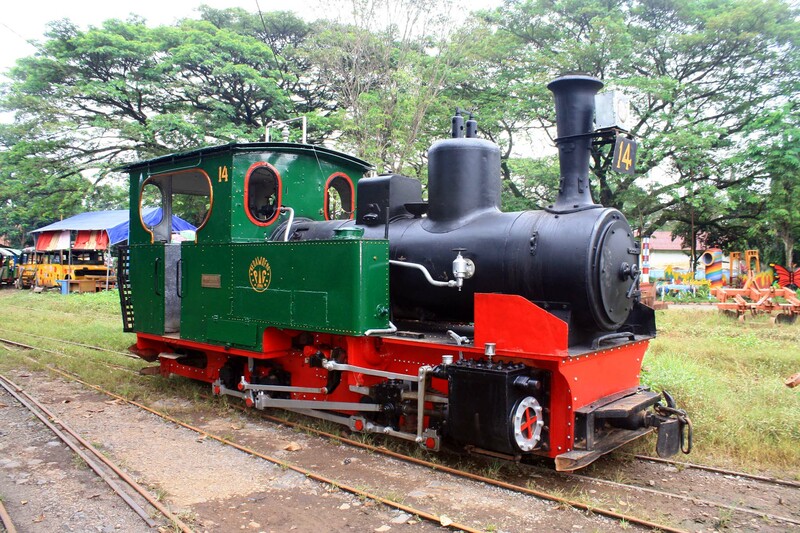 Built by Backer & Rueb in Breda in Netherlands, back in 1912, this locomotive has colorful history behind it. 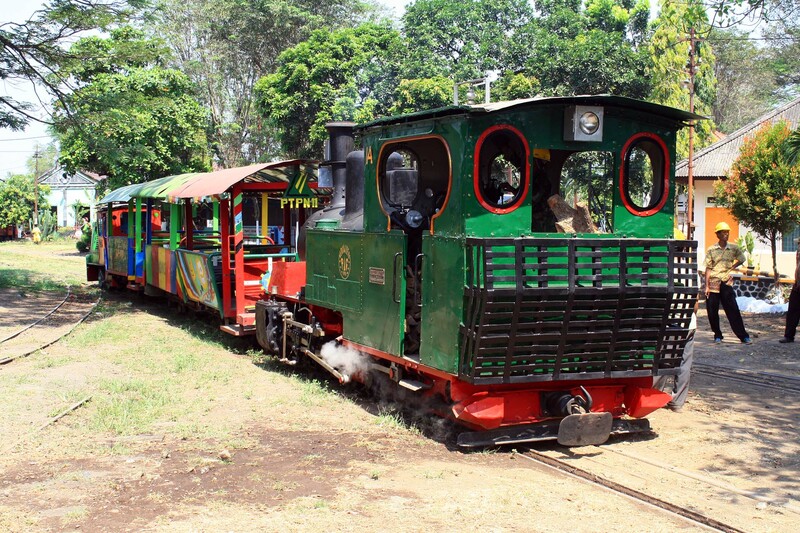 It was originally operated by Railway Company in Bangka Island, near Singapore. 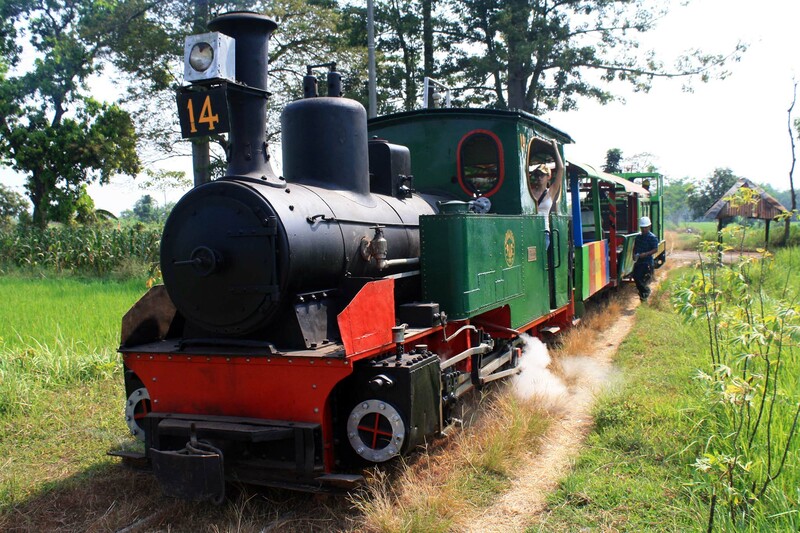 It was used to haul tin ore, and also hauling passenger trains. 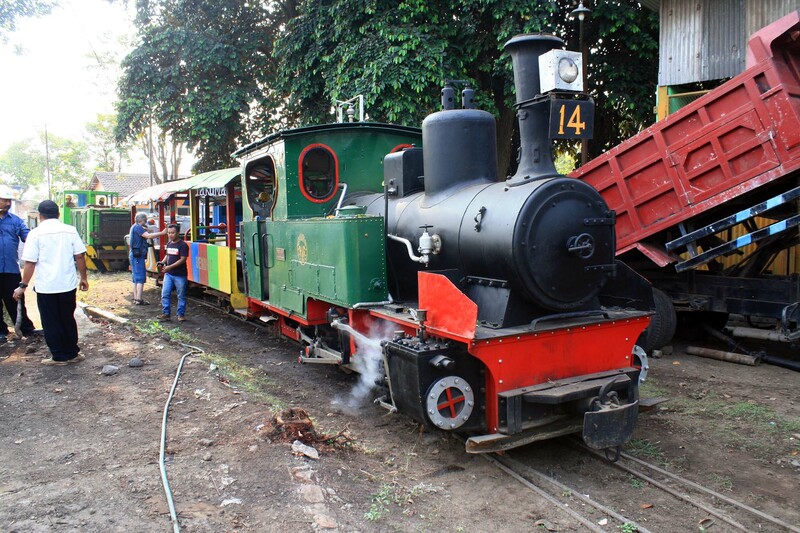 There are several versions on how this locomotive was purchased by the mill and ended up in Kedawung: one version said that when the railway network closed in 1960s it was transferred to East Java, but other theory said that it was transferred during Dutch colonial era. 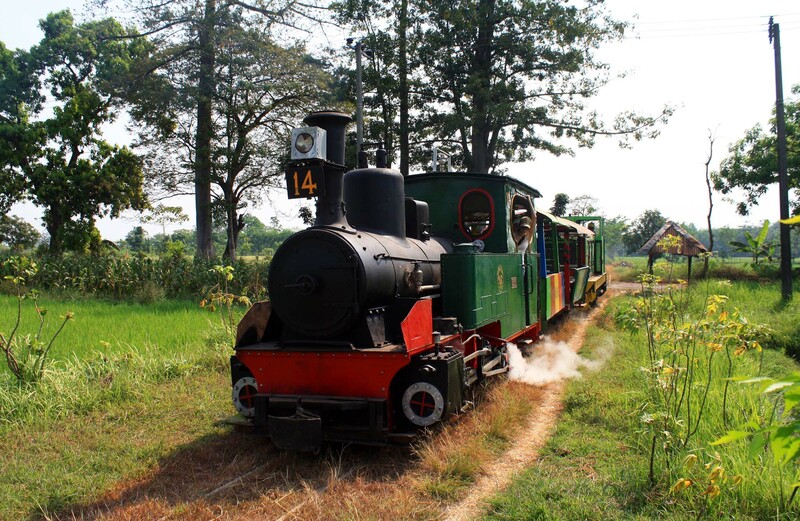 Whichever is true, at least this rare locomotive, and sole survivor of Bangka railway network, is in safe hand. 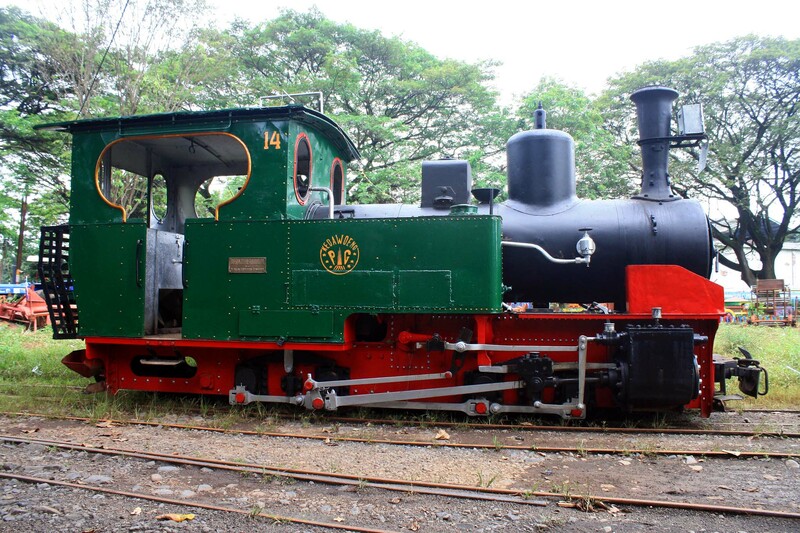 However the biggest surprise of all has to be the reactivation work of steam locomotive number 14. Prior to this, I already knew from the shed crew that this locomotive is actually in the best condition, and can be brought back to service with little repair works. But the hindrance in the past was financial restraint. Now with the profit generated from the theme park, they can finally get enough funds to reactivate this 1913 built steam locomotive. Months passed since the first time I found out about this good progress in January 2018, when the mill manager suddenly sending a video message, through Whatsapp, to me on 12th March 2018 informing that the number 14 is now back in running condition! And a few days later, the locomotive is officially inaugurated and recommissioned back to service on Friday 16th March 2018. Wow! This is good news! 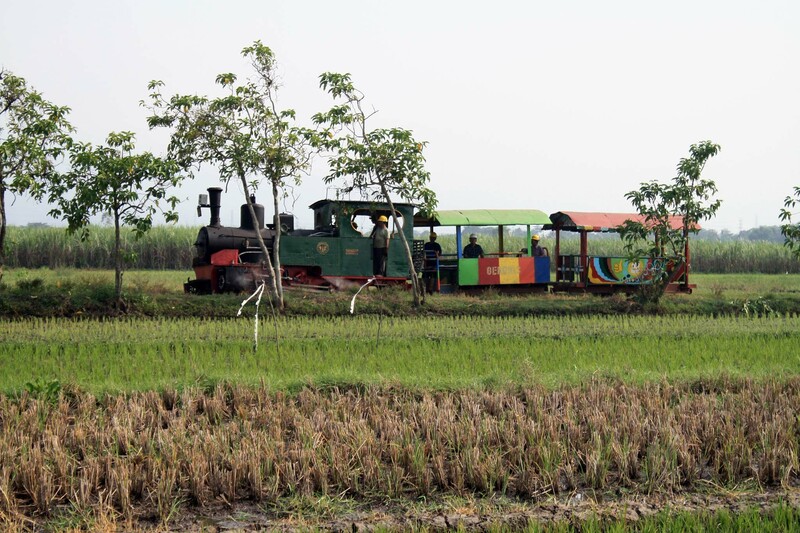 Now there is a live steam train attraction that is within easy reach from Surabaya. 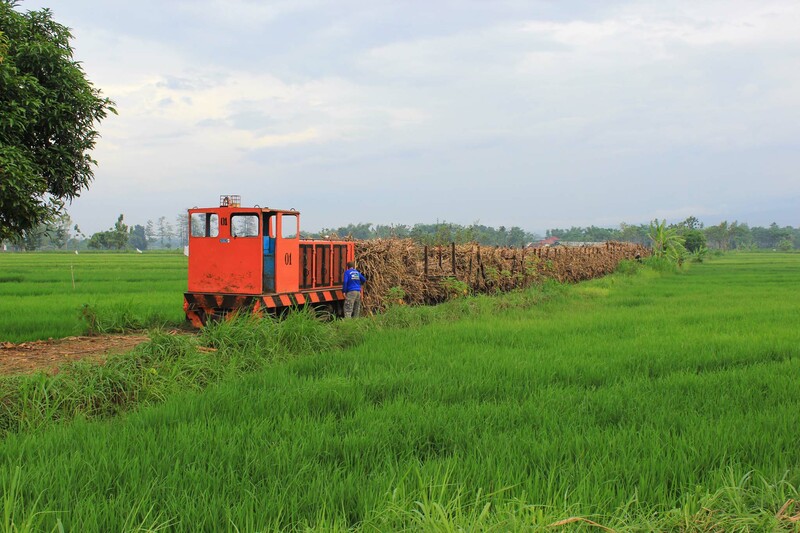 I quickly go to Kedawung sugar mill on following Saturday to see this good news by myself. 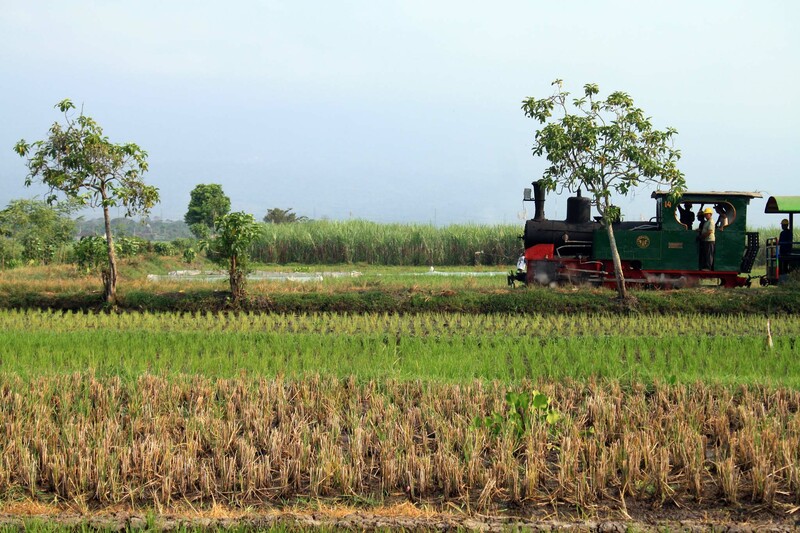 Before arriving at the mill, I was expecting to see the steam locomotive running around like those in Agrowisata Sondokoro at Tasikmadu sugar mill in Central Java, or even better: traveling on the field lines. But when I entered the mill, I was greeted by the sight of rather quiet theme park. No sound of steam locomotive to be heard. Instead I was greeted by the theme park manager. He explains about the inauguration party that took place yesterday. After the celebration in front of the management’s office, they took the loco for a trial run to the west from the mill. Then I asked him why he doesn’t run the loco now? He said that the locomotive would only be used for chartered excursion trains only. Well, that’s a bit disappointing. I thought they would use it in the same fashion as those in Tasikmadu. 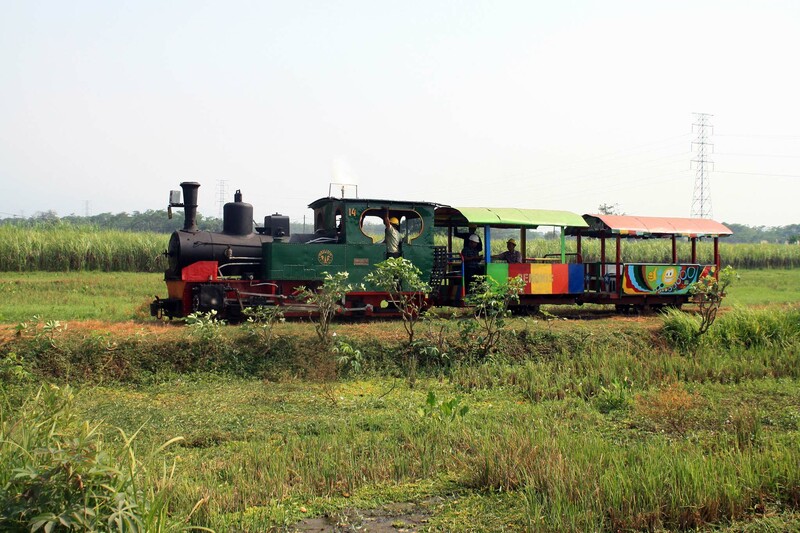 He said that considering the temporary downturn of theme park revenue (when I visited the place it was rather quiet), the mill management decided to play it safe by only running it for chartered train. He then took me to the locomotive shed, where he shows me the locomotive. It’s great to see that now it looks in a nearly pristine condition. The choice of livery color is actually inspired by the old photo that I send to mill manager. Once he asked about the ideal color for the locomotive, and I gave him some photos from Rob Dickinson’s collection. 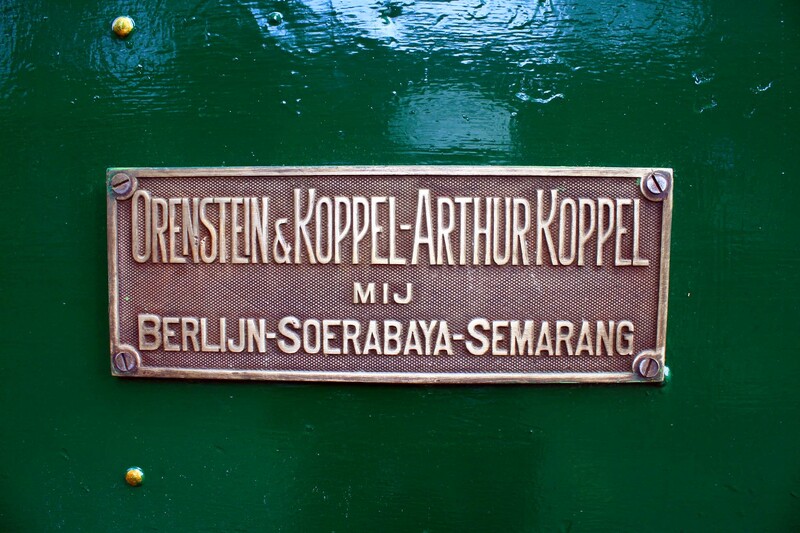 And what is more, the loco still retains its original Orenstein & Koppel builder plate too. After inspecting the newly reactivated loco, I bid farewell to the theme park crew and head back home. 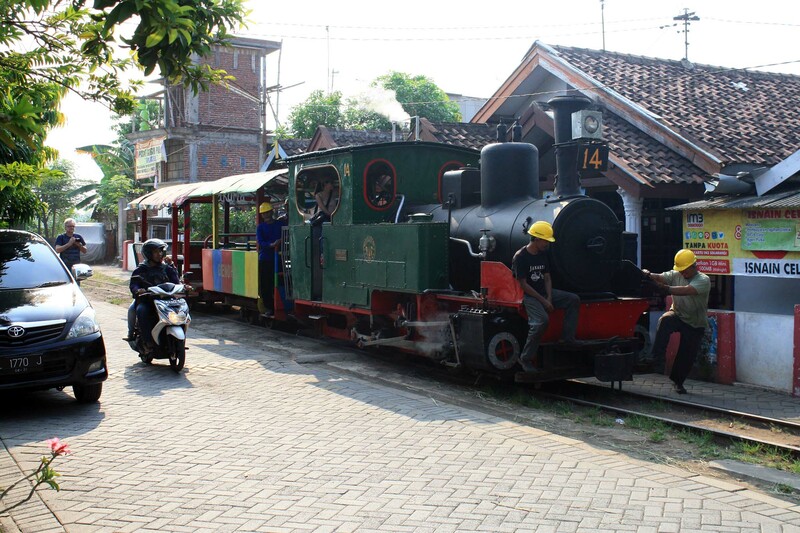 With the completion of steam locomotive restoration, now I’m confident that I can begin selling steam railway tour packages that is as simple as my Bromo tour package, or my Surabaya city tour. I began to compile my website to advertise the steam tour package, and also printing some brochures. Despite of my effort to advertise the steam tour package (in conjunction with my existing Bromo tour package), things didn’t go smoothly. There were initially no interests shown on the tour package. Not even a tour inquiry was made. 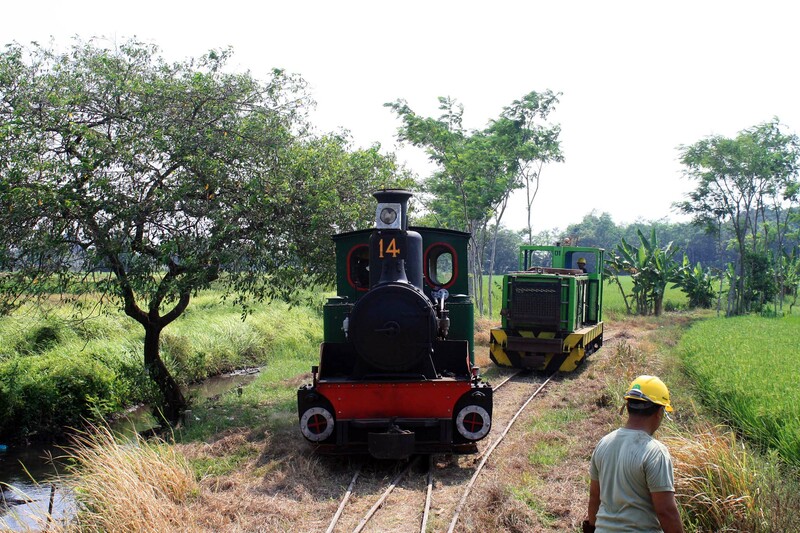 I began to wonder whether if the steam locomotive tour in Kedawung is feasible, even if it’s easily within reach from Surabaya? Fortunately, the tour request does eventually come. A friend of mine from UK, Robin Gell, said that he is interested to have a tour in Surabaya, for his upcoming Indonesian visit to see his fiancée and in-laws. 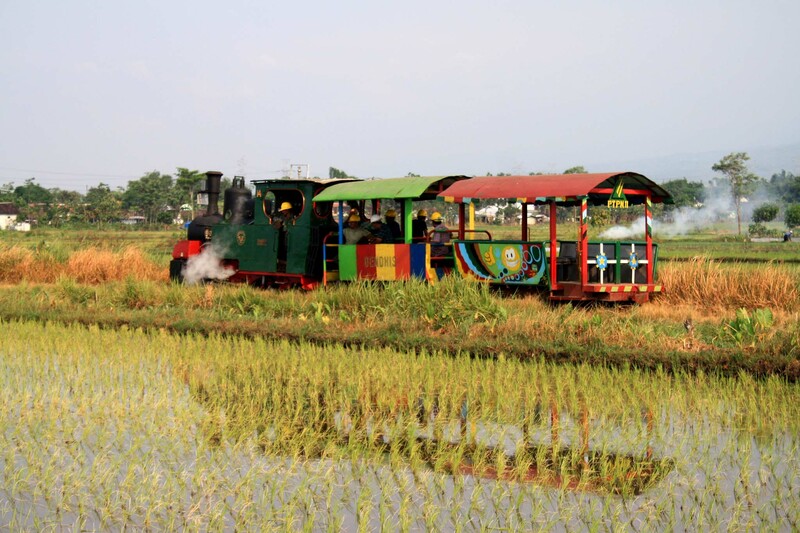 Robin have helped me to advertise my Java Steam & Sugar tour package back in UK, and keen to have a hands on experience on parts of the upcoming tour (aside of visiting Bromo volcano). After some calculation and preparation, we eventually decided to take the tour on 3rd May 2018, a day after we go for a tour in Bromo volcano. On 3rd May 2018, we finally arrive at Kedawung sugar mill for the tour. Despite of the fatigue caused by the Bromo sunrise tour on the previous day, it didn’t reduce our excitement to have this steam tour. The entrance to the mill was virtually free. With the opening of the new theme park, now anyone can go into the mill without any need to arrange lengthy permit or paying expensive permit fee. Indeed, we paid nothing to get in, when the security officer spotted Robin on the front seat. 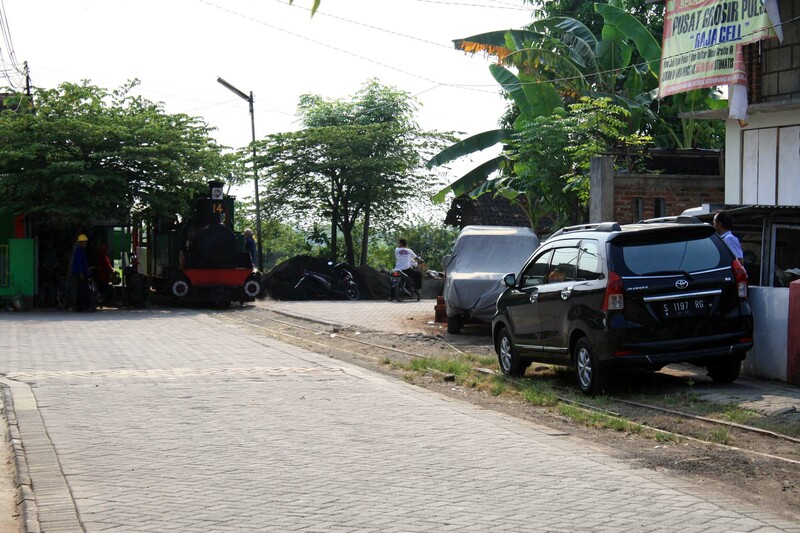 I parked my car in a house near the starting point of the field lines, and as soon as I disembark, I was greeted by Syaiful, a mill employee who is in charge of theme park and amusement train operations. He has been busy preparing the steam locomotive, hours before we arrive. This is the first time I see this loco in steaming condition, after years of seeing her neglected inside the shed. 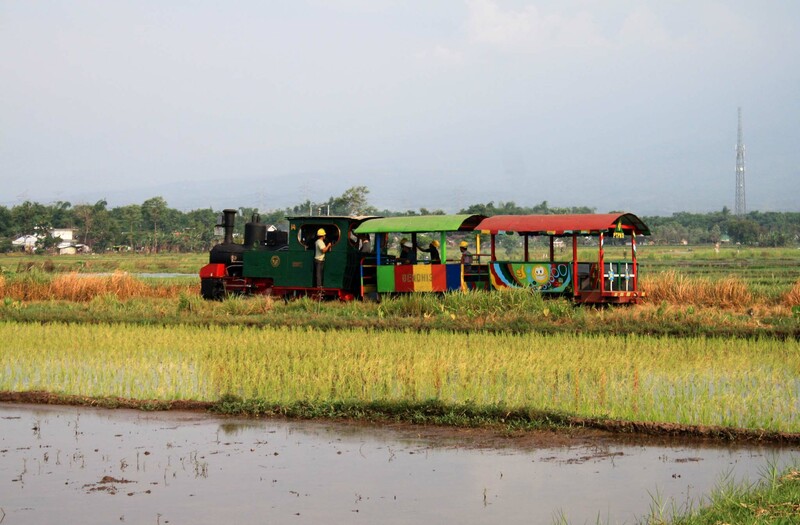 Since the number of participants is just 2, we only request a single coach to accompany our trip. But somehow they added additional coach, possibly to act as ballasting. We depart into the field lines, as soon as Robin give clearance (he pays for this journey, so he is the boss!). The starting of the journey turned out to be very rough and noisy. Possibly the roughest train ride I’ve ever had. Due to uneven wheels surface, and lack of suspension, combined with poor track condition, this made our coach ride very bumpy. Not to mention noise generated by banging metal parts caused by vibrations. But the unpleasant ride is compensated by the beautiful surrounding scenery. 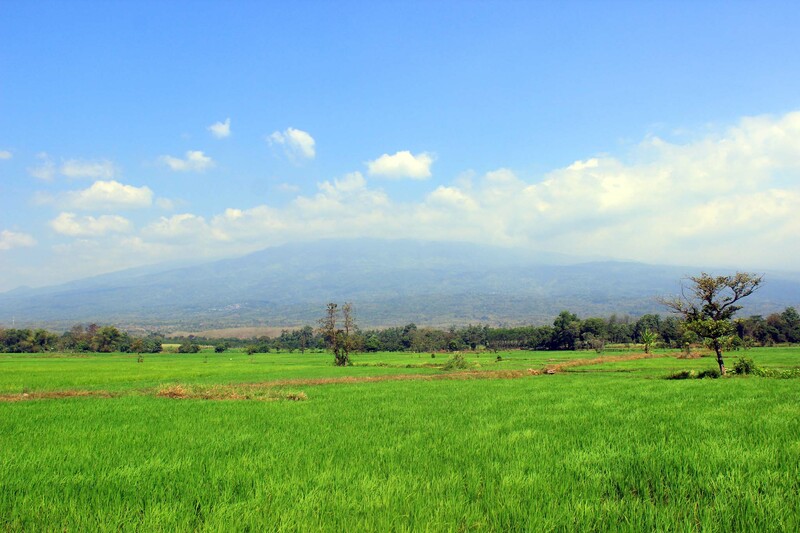 The nearly endless vista of rice field with the backdrop of mount Bromo (admittedly it was largely obscured in haze when we had this trip), making the journey a one of a kind excursion ride. 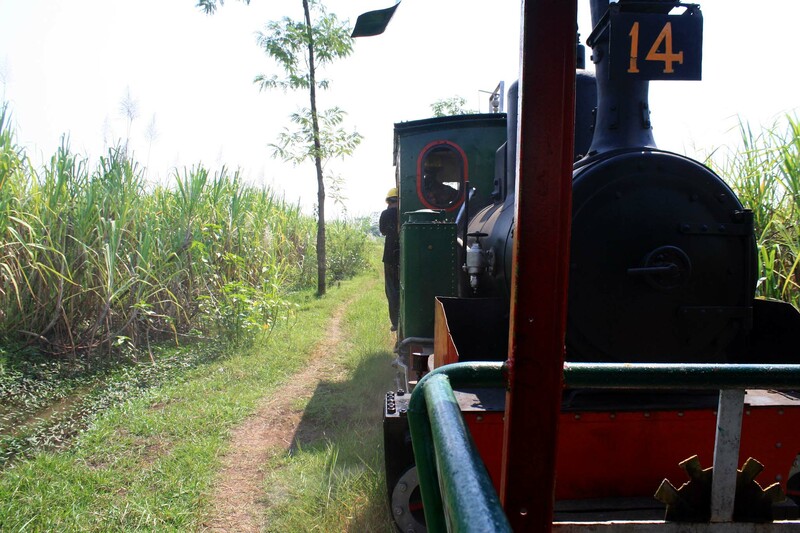 Aside of rice fields, we also passes through the sugarcane fields, where its sugarcane are nearly ripe for harvesting. Sometime we pass through some small villages under the shady sengon (albizia chinensis) and bamboo trees. This trip truly allows you to immerse yourself with the surrounding scenery, something that cannot be done with the mainline trains. As we approaching the village of Kawisrejo, I notice that now there is a motorway construction nearby. Although its location is actually quite far from the railway track, but it can be clearly seen. The construction trucks traffic also damaging the main road in the area. Up until last year, driving along this road was very pleasant as it had smooth surface, quiet traffic, and scenic vista. I’m quite disappointed by what I see. I hope that this would not let the conversion of this beautiful countryside into urban area. Just after crossing the main road, our train stopped at a junction. Syaiful said that this is the terminus point of our journey. From here, the locomotive will be reversed in position, and we return back to the mill again.I was thinking, had we gone beyond all the way until Kawisrejo village, it would have been a great journey. But due to the locomotive’s short water supply, we simply can’t do that. In here the locomotive is detached, while a diesel loco pulled the coaches into the line to the right. 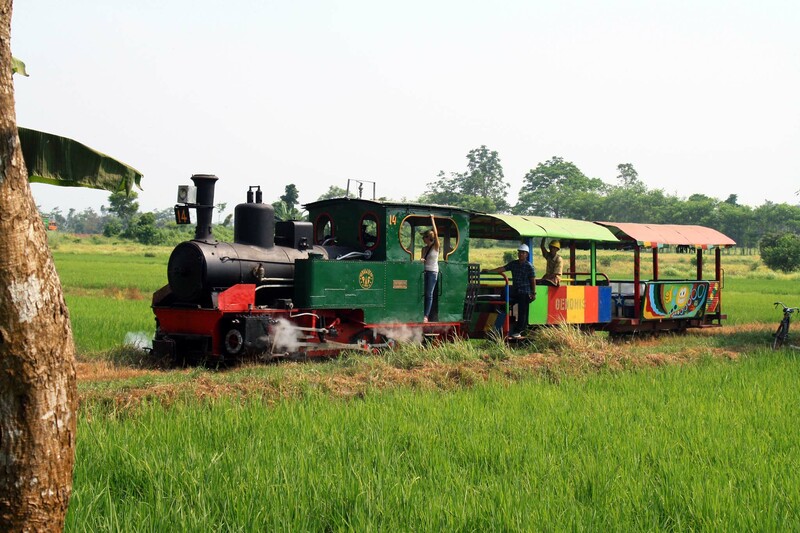 I didn’t realize if our trip is accompanied by a diesel loco, because for most of the journey, we didn’t see it around. While they move the locomotives around, I notice that a fire have just started in the middle of the track (you can see it on the left track). 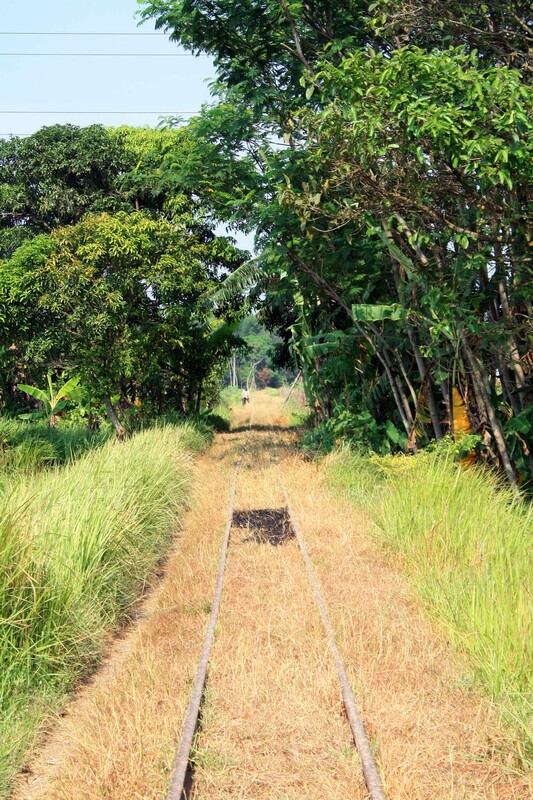 Apparently, the sparks from the firebox ignited the grasses in the middle of the track. 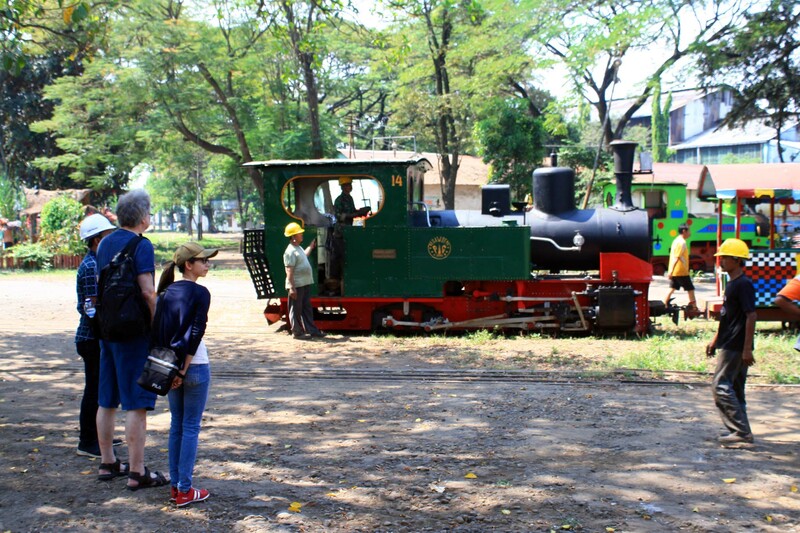 Once the steam locomotive reversing its position, it is reattached to the wagons. While waiting our train to depart, I asked Syaiful whether if it’s possible to do a photo running. He said it is perfectly possible. Then I turned to Robin and offered to do some photo running. He agreed with that. 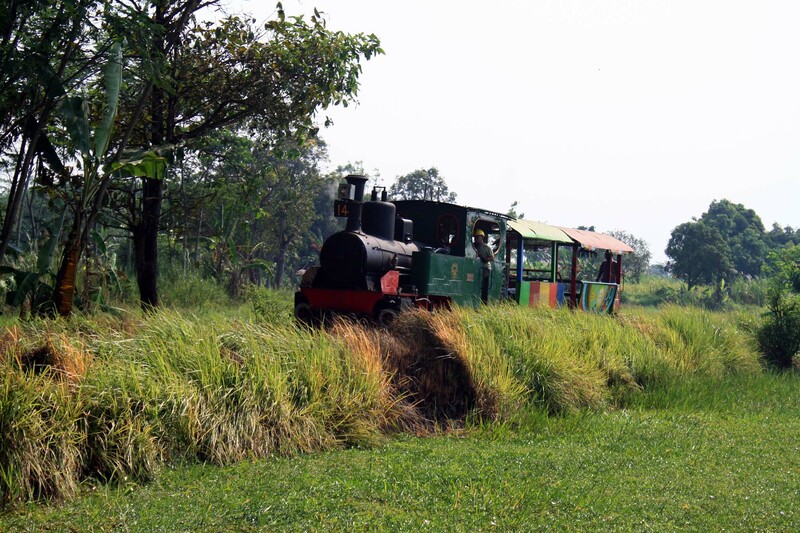 So we went to an embankment near the level crossing to capture the train as it passes through the scenic rice fields. The scenery is actually scenic, but in here I realized that I have made some mistake by trying to start the tour after midday. Apparently the harsh sunlight making my photos look darker, due to backlight effect. I waved my hand to signal the train to depart, and start the photo running session. I have to say that she looks truly gorgeous. Once it crossed the main road, the train stopped so Robin and I can rejoin the train. The train make a brief stop in this spot, so we can take some more additional photos. After we took enough photos, we resume our return journey to the mill. 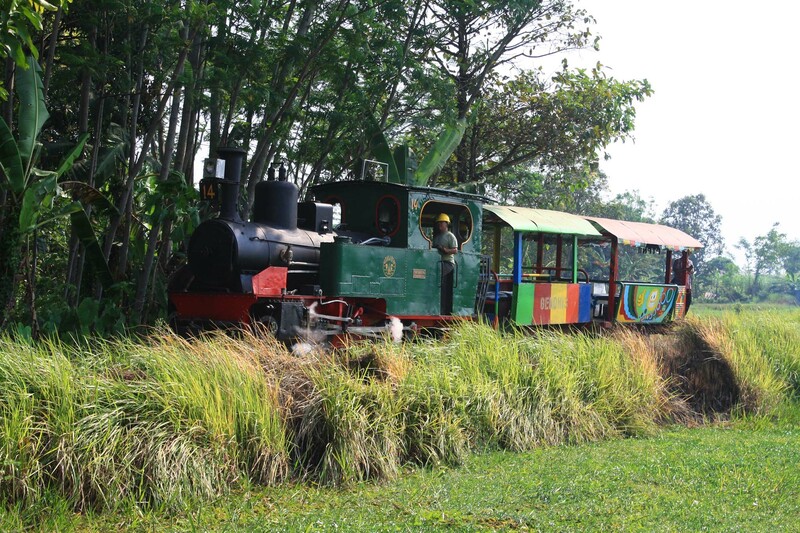 This time everyone hop onboard the locomotive’s cab. Since the fireman never opened the firebox door throughout the journey, it feels rather cool onboard the cab. As we travel along, I notice some unusual thing which could probably be used as a cue to find steam locomotives working. 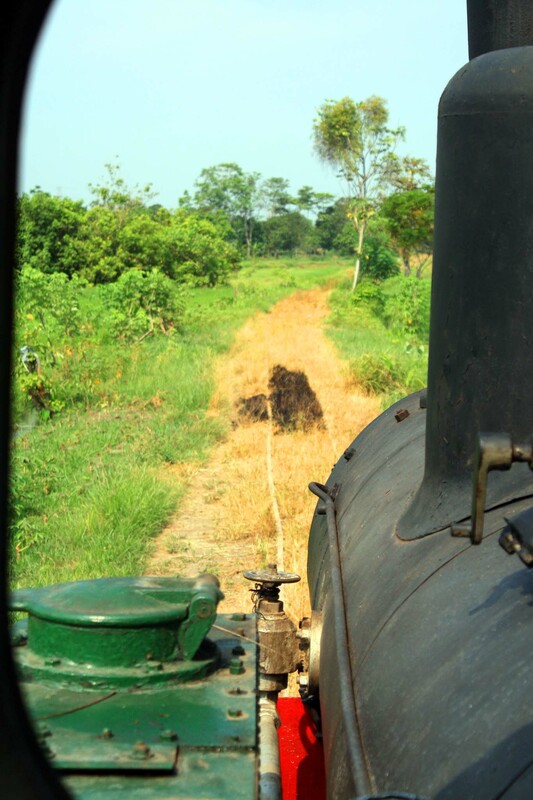 Apparently steam locomotives would leave a trail of burning grass patches on every line it passes. Had regular steam locomotives working were still around, this could have been very valuable. 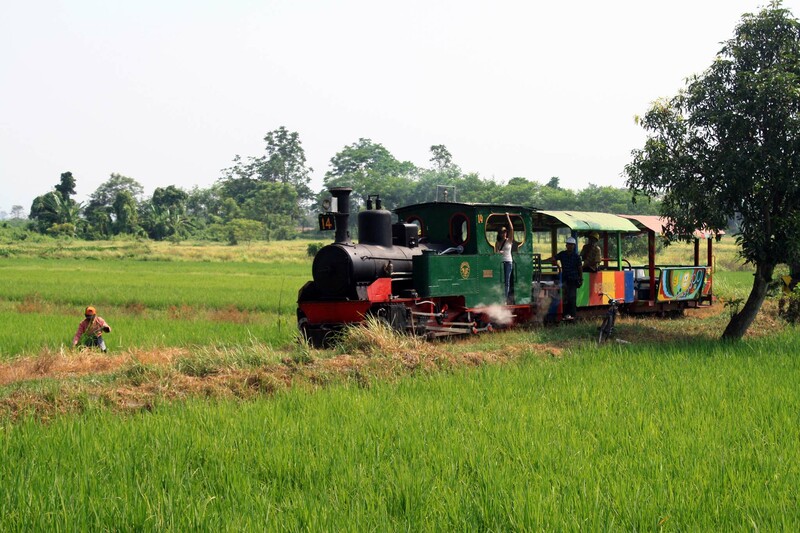 When our train approaching Toyaning village, I asked the driver to stop. We decide to do a couple of photo running in this area, as it has quite a dramatic scene. We resume our journey again after that…. but for a very brief period! Once inside Toyaning village, Robin wants to do photo running in the village, as its leafy surroundings will give backwater scene. If that’s not enough, he also asking for additional photo running in the sugarcane field just outside the Toyaning village. 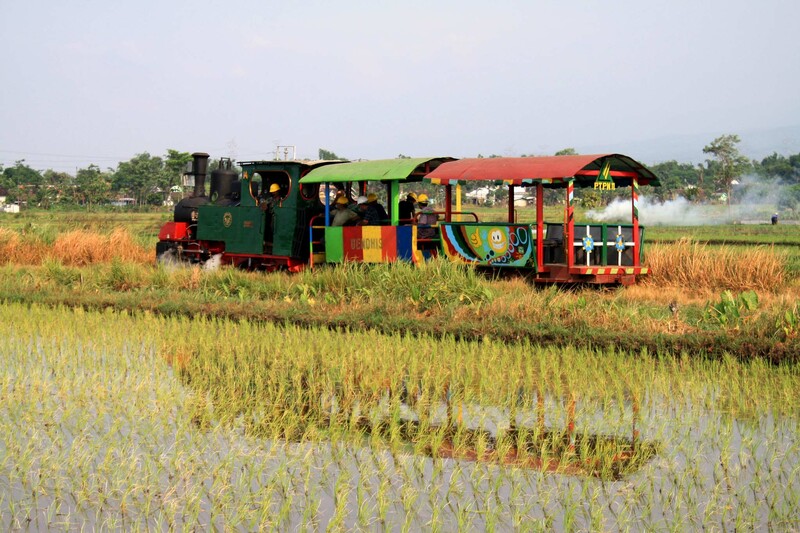 And for the final photo running, we do a photoshoot of the train as it passes through the rice fields. Had the sky was clear, we could have seen mount Bromo in the distance. Alas, the best that we can get of the volcano just a faint sight of its feet. 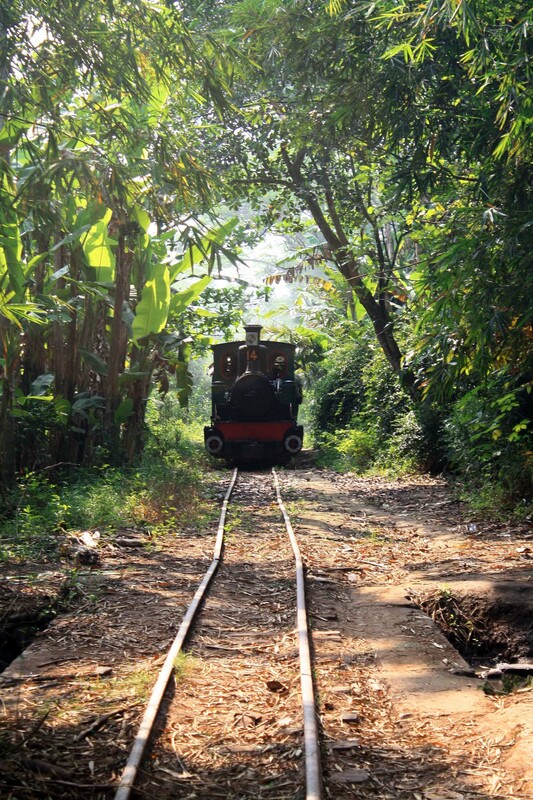 We return back to the train for to resume the return journey. Once onboard, the driver told us that he cannot do additional photo running session as the onboard water supply is critical. So we have to be content with what we have got, which I think it’s sufficient enough for our documentation. I think that was the last photo running session for today…..or is it? As we approached the village near the sugar mill, apparently there are some visitors who parked their cars in the middle of the track! Our train stopped as train crews knocking the doors of the houses around the track to find its owner. Robin and I use this opportunity to do another photo running. Once they find the owner, they ask him to move the car off the track, and we resume our journey. 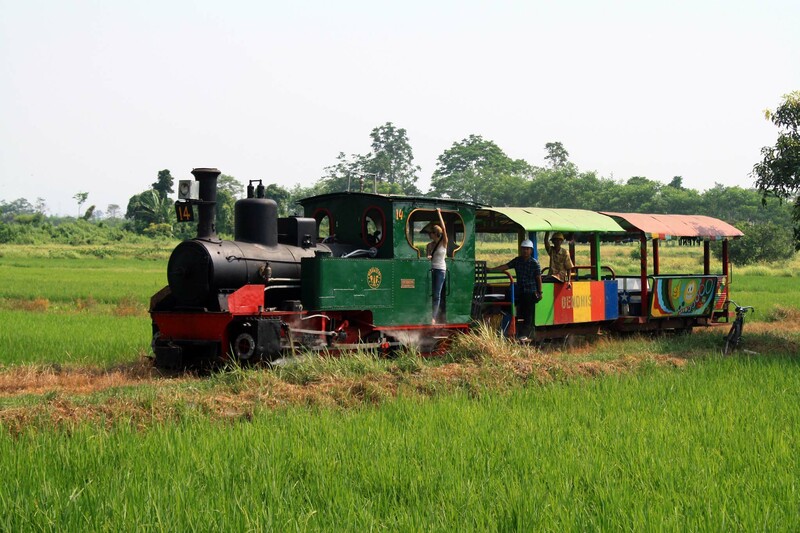 Since our destination is only a few meters away, our train traveling at very slow pace and it’s easy to rejoin the train without stopping it. And within a few minutes, our trip eventually came into conclusion. We are happy that our tour has proceeded smoothly and safely without too much hitches, and not even a single bureaucracy bungle get in the way. Upon bringing our belongings back into the car and bidding farewell to the train crew, we return back to Surabaya to have a rest. This has to be the smoothest railway tour I’ve ever run so far. And it is also much easier to run when compared to another steam train tour, where I had to drive long, arranging accommodations, and even facing bureaucracy hurdles. This one is simply goes in, doing the excursion, settling the payment, and go home! I hope that you enjoy reading my blog posting. 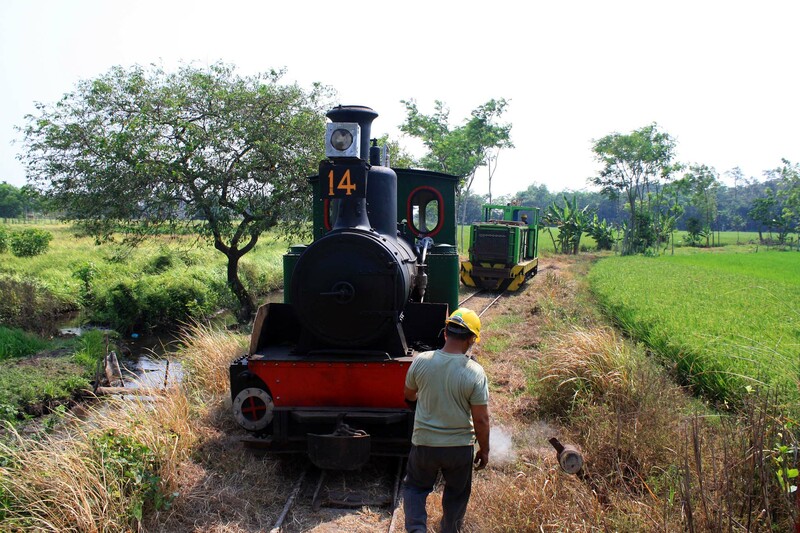 If you like to have similar tour, you can book it through my website, or you can also join an even longer and more complete tour that feature many steam locomotive workings in sugar mills in Java. 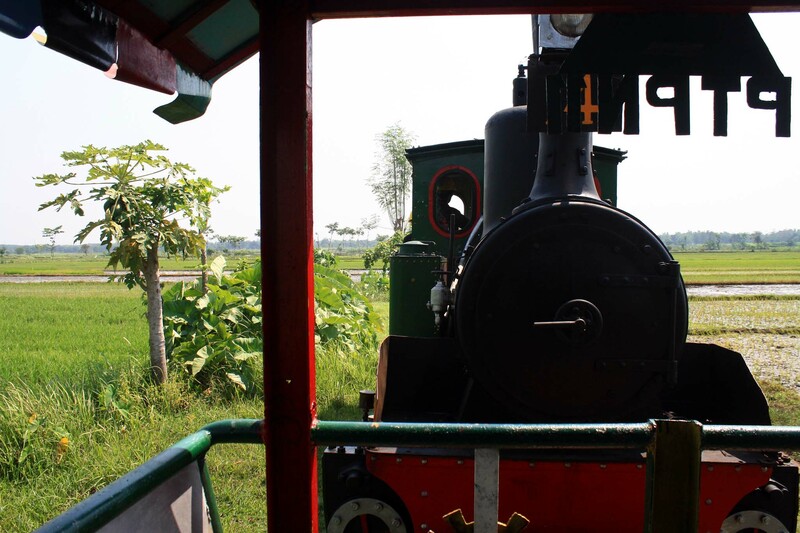 Before we go, here is the movie of our steam locomotive in action during that day.